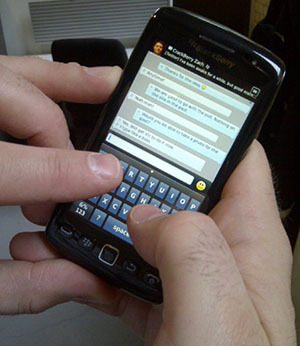 CrackBerry Poll: How do you type on your BlackBerry? After being in the BlackBerry world for awhile now, I’ve seen a few interesting ways different people type on their BlackBerry, from the "normal" two thumb typing method to a crazy index finger/thumb combination. We wanted to poll the vast CrackBerry community and see what method our readers prefer to use. So CrackBerry Nation, get to the polls and see which typing style is the king! If we didn't cover your typing method in the poll make sure you head to the comments on this post and share your style with the CrackBerry community. Thanks Alex Kinsella for the photo!